When I looked at the gear list on this boat I realized that it met most of the attributes mentioned in Bill and Pat's Callipygia blog. The boat was a little tired with peeling teak topsides but overall it looked solid. I could stand in the galley, stand in the head, stand in the aft cabin.... stand up straight everywhere! 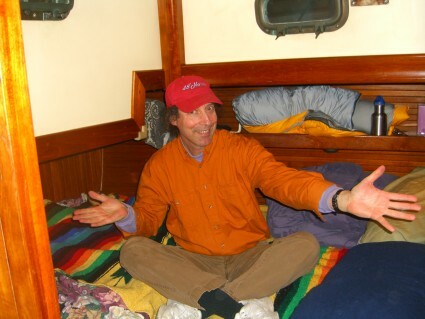 I hopped into the master berth and it fit. So did the Vee berth. With dreams in my head I headed north back to Seattle to talk it over with Connie. June 12 44 Lafitte $ 129,900 Admiralty Yacht Sales. Been around the world. An awkward setup with the companionway ladder leading to the quarter berths but otherwise a beautiful yacht. July 2 - Valiant 40 "Halcyon" at Shilshole Signature Yachts - Nice boat but I couldn't stand up in the head. July 10 - Island packet 35 $143800 Chapin Day with Signature Yachts - a very nice boat we would have bought if we had the money. July 10 - 1987 Moody 422 $129,000 Ryan at Swiftsure Yachts - Not in very good shape. Didn't like the low headroom in galley. There is another one with offer on it at Bainbridge Is. named Phantom 1980 for $ 159K This would be a wonderful boat but too expensive for me. We also saw Pete McGonagle's Nordic 40 at Shilshole. A good looking boat but not for sale. August 21 - saw a Passport 40 belonging to Heidi and Kirk at Elliot Bay Marina and I really liked the layout. A Bob Perry boat. August 28 -46 Formosa Peterson Center Cockpit - $124k at Diamond Yacht Sales in Blane WA was a nice boat and I wanted to put an offer on it but I held back for something a little cheaper. This boat is much like a Kelley Peterson 44, a very popular long distance cruiser. Sept 20 - 1989 Passport 41 - Jubilee $199k Elliott Bay Yacht Sales - just had to look. Feb 5 Seattle Yachts -Paris Woodard showed us a Norseman 400 with Sale Pending at 125k Nice! and a TA Shing Panda $ 160k Beautiful and a Krogen 38' Cutter 99k that would have fit the bill, but it has a full keel. Interesting..
Sail Northwest - Bob Ross showed us an Avance (Swan Type) 40 119k Sail Northwest Not enough headroom. 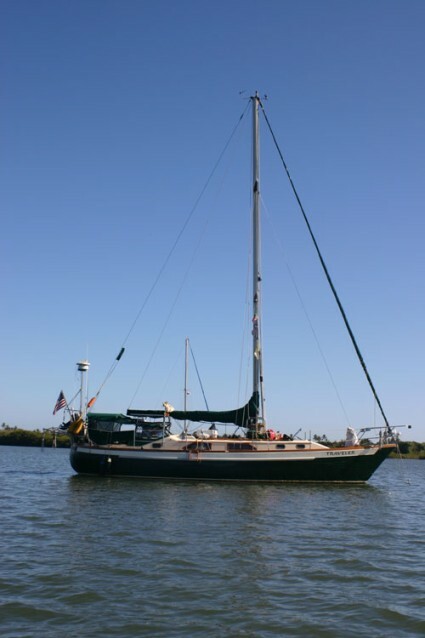 Feb 6 Elliott Bay Yachts had a 41 CT Ketch 1981 54k Old and big, with a full keel. Then we saw a Pearson 385 65k kinda junky, needs lots of work. Not enough headroom. At Signature Yachts we sall a Wauquiez (Vo Kee A) Centurion 42 129k nice looking , clean, up and over entrance to the cabin might be difficult in a sea. I really liked this one. Feb 10th Spoke with Mark Gilbert at Discovery Yachts who advised me about working with Ron Gullan at Yachtfinders in San Diego. Feb 16th . Flew to San Diego to look at some boats with Tom O'Neill with YachtFinders/WindSeakers. Saw a Columbia 50 99k - Large sweeping deck. BIG boat... too big. Mason 43 - 129k A wonderful passage maker. Open cockpit. Side entrance. Yum. Morgan 41 - 75k - roomy, clean , nice radar arch, tempting. Then Tom showed me a 1982 Passport 42 and I fell in love.